The fans were treated to an electrifying night of action at Kuala Lumpur’s Badminton Stadium on the 8th of October as EFN Champions league 8 came to town. Alongside several exciting MMA match ups as part of the Road to Abu Dhabi series, with the finals of the Abu Dhabi Warriors MMA series set for the 22nd of November in the UAE capital. 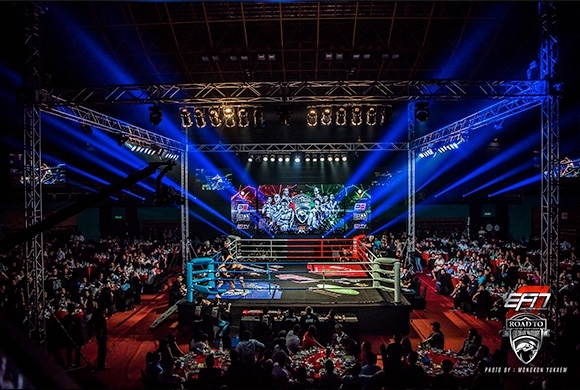 The muaythai portion of the card saw two 4 man tournaments, one at 65 kilos and the other a 72 Kilo tournament to decide the 3rd contestant to go through to the Kings birthday tournament on the 5th of December in Bangkok. The Muaythai action opened with a super fight between local fighter Iwan Merican and Thai fighter Nonthachai Kiatkorwit. The Thai fighter forced the pace throughout and looked a bit stronger and more dominant in the clinch, managing to throw down Iwan several times. Nonthachai took the points decision at the end. In the first of the 65 kilo semi-final fights Petsaharat Sor Kiatiwat of Thailand faced Ncedo Gomba of South Africa. It was Ncedo who started the faster, landing with some eye catching jumping knees and kicks early on, before dropping Petsaharat for an 8 count near the end of the 1st, with a sharp overhand right. Petsaharat tried to get back into the fight at the start of the second, attacking Ncedo with some sharp kicks and solid punches, but by the second half of the round seemed to have run out of gas. In the final round Ncedo was in cruise control and took a clear win at the end. The second semi-final saw Amir Naseri of Iran take on Malaysia’s Wes Jaya. Wes was the more aggressive, forcing the fight from the start, but Amir showed a clever control of the clinch and some clinical elbows, cutting Wes in the opening round and dropping him for an 8 count in round 2. Wes kept coming forward n the last round looking to punch, but Amir was never troubled and took the decision. In the 72 kilo tournament the first semi-final was over fast when Thiraphong Kiatkorwit made short work of Malaysia’s Muhammed Al Saiyuti, hurting him with solid left punches before finishing the fight with a minute to go of round one with some devastating low kicks. The second semi-final also failed to see the distance as Kurits Michael Allen of the UK took apart Bow Suweilek of Malaysia in the second round, dropping him early in the round with a fast high kick to the jaw and then finishing the fight with a barrage of punches shortly after. The final of the 65 kilo 4 man saw Ncedo looking aggressive in the opening round of his fight with Amir. The young Iranian looked composed though and in round two the crowd saw more of his clinical elbow work, as he drove a hard, rising elbow through the guard of Ncedo, dropping the South African down for the count. In the 72 kilo 4 man final Kurtis looked to have a bit of a size advantage over Thiraphong and the Thai fighter fought a cagier fight plan this time, sitting back more and looking to pick of Kurtis with fast counters. Kurtis pushed forward well and caught Thiraphong with a few sharp punches, but Thiraphong never looked troubled and was awarded the decision at the end. Earning his place in the final 4 man on the Kings birthday and making up for the disappointment of losing in the semi final the previous year, to the tournament winner Sean Kearney.